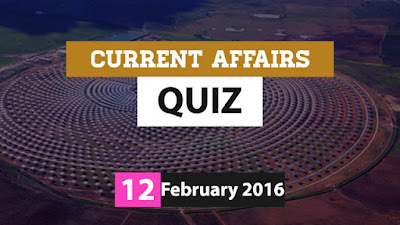 Hi Aspirants..Here is the Current Affairs Quiz for 12 February 2016. Trending topics include Davinder Singh, Mobile-one governance application, Australian High Commissioner to India, Aurobindo Mukherjee etc. Attempt the quiz and share your score. 1) Name the Indian-origin lawyer who was recently named Vice-Chairman of International Chamber of Commerce Commission (ICC) on Corporate Responsibility and Anti-corruption? 2) Which Indian IT company has recently acquired US based healthcare technology firm HealthPlan Services for US 460 million dollars? 3) Mobile-one governance application of which state has recently won gold medal at the fourth World Government Summit in Dubai, UAE in the m-governance awards category? 4) Who was on 11 January 2016 appointed as the Australian High Commissioner to India? 5) What was India's rank in the Intellectual Property Index (IPI) by United States Chamber of Commerce (USCC)? 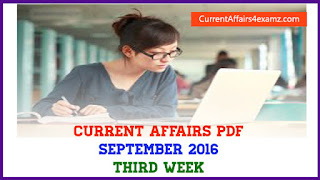 6) Aurobindo Mukherjee who passed away in Kolkata, West Bengal on 11 February 2016 was a veteran? 7) Which state Government has recently signed a memorandum of understanding (MoU) with Ministry of Railway to form a joint venture (JV) company for the expansion of railway tracks in the state? 8) First phase of the world’s largest concentrated solar power (CSP) plant was recently launched in the Souss-Massa-Drâa area in which country? 9) Which country on 11 February 2016 appointed women ministers for the newly created portfolios for happiness and tolerance, and youth affairs? 10) Which bank on 9 February 2016 announced its tie-up with Smartbox Ecommerce Solutions for solving challenges related to last mile delivery for e-commerce firms?